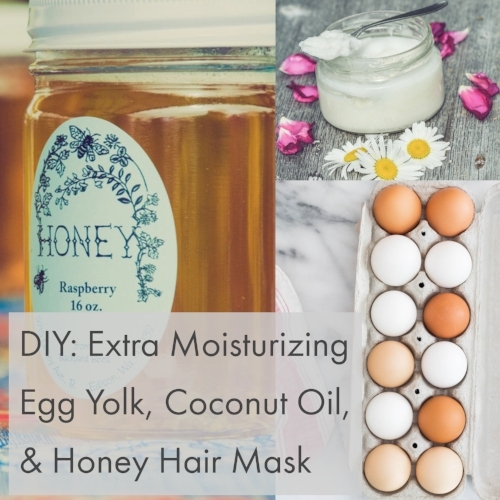 This easy, affordable, and moisturizing hair mask is perfect for all hair types - especially those with dry or frizzy hair. Honey is truly a magical ingredient - it's naturally moisturizing, cleansing, and it repairs dull hair without weighing it down.The egg yolk contains protein which helps strengthen and moisturize hair (and prevents breakage!). Coconut oil penetrates the hair shaft to condition and smooth hair cuticles which helps with frizz and dryness. We tried this hair mask and were amazed with how soft, shiny, and moisturized our hair felt. 2. With hair wet, lightly warm up coconut oil so it becomes a liquid. Be sure to not heat it up too much (or wait to cool down to room temperature) because it will cook your egg! 3. Mix egg yolk, honey, and coconut oil in a bowl and lightly warm up in a pan (again for around 10 seconds just to get it warmed up and not cooked).